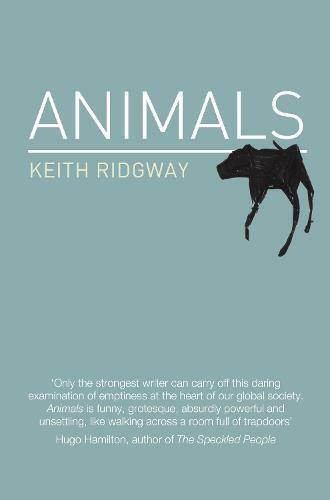 A novel of confusion and paranoia, love and doubt, fear and hysteria: unsettling, unhinged, provocative and bestially funny, `Animals' is for human beings everywhere. Keith Ridgway's third novel is a psychological menagerie of confusion, paranoia, searching and love. Narrated by an illustrator who can no longer draw, it tells of the sudden and inexplicable collapse of a private life, and the subsequent stubborn search for a place from which to take stock. We are surrounded here - by unsafe or haunted buildings, by artists and capitalists who flirt with terror, by writers and actresses and the deals they have made with unreality, and by the artificial, utterly constructed, scripted city in which we have agreed to live out a version of living. But there are cracks in the facade, and there are stirrings under the floorboards, and there are animals everywhere you look, if only you'd dare to look for them. Unsettling, unhinged, provocative and richly funny, `Animals' is for human beings everywhere.